Among the variety of products marketed by steel fabricators are steel kitchenware, which can be found in many people’s homes, and steel gardening products, which are used by consumers as well as commercial property managers and landscapers. Steel reinforcements and wire are used in the construction of buildings, bridges and other large structures. Automotive components, auto bodies, airframes, marine vessels and other kinds of vehicles can all feature steel in their construction. The steel used for each of these applications must, before it can be used, be refined from iron ore and alloyed with carbon and other additives. Some steel fabricators may be involved with this process, but most are involved with the forming processes that follow. After becoming steel, raw steel must be shaped. 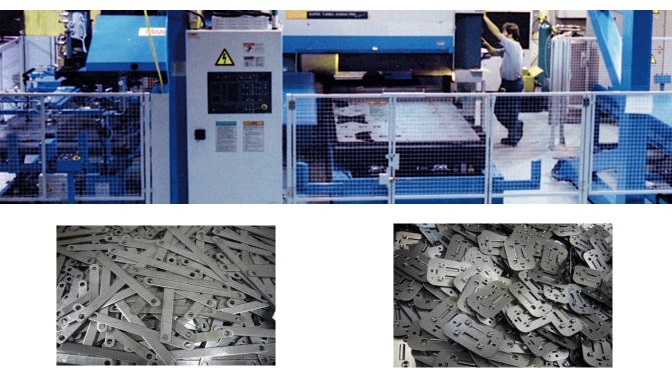 Because a given metal shaping process cannot produce all varieties of metal shapes (the process that produces metal wire cannot also produce metal sheets), many processes are necessary to produce the range of metal products in use today. The long list of contemporary metal fabrication methods includes roll forming, press brake bending, punching, stamping, welding, laser fabrication and many more methods. Once a collection of raw steel has been engineered to the right specifications, it is usually formed through a rolling or bending process. Rolling is a popular steel forming method because it can simultaneously shape and strengthen the metal as it is processed. A roll former is composed of a long series of rollers into which raw steel is directed. The first set of rollers is designed to fit snugly around the contours of the steel, drawing the steel in as they turn. In some cases, the rollers can be designed to compress the steel, which can strain-harden the metal, making it stronger. Each subsequent set of rollers’ configurations differ slightly from the previous set, and the steel’s shape changes with those configurations. By the end of the process, the steel has taken the shape of the last set of rollers, emerging as a newly-rolled product. Other fabrication methods like press braking are less complicated as well as less automated. A typical press brake can create one bend in once piece of metal at a time, and they are often manually operated. Steel Fabricators Steel fabricators are companies that offer steel processing services. Steel fabricators, like all metal forming operations, provide an invaluable service to companies in the consumer products manufacturing, agriculture, automotive, construction and countless other industries that make use of fabricated metal products in some way.